Aishel Real Estate provides buyer/seller services, but also property management, property investment advising, and rental properties. They needed their new homepage to help drive users to the appropriate content page quickly and easily. 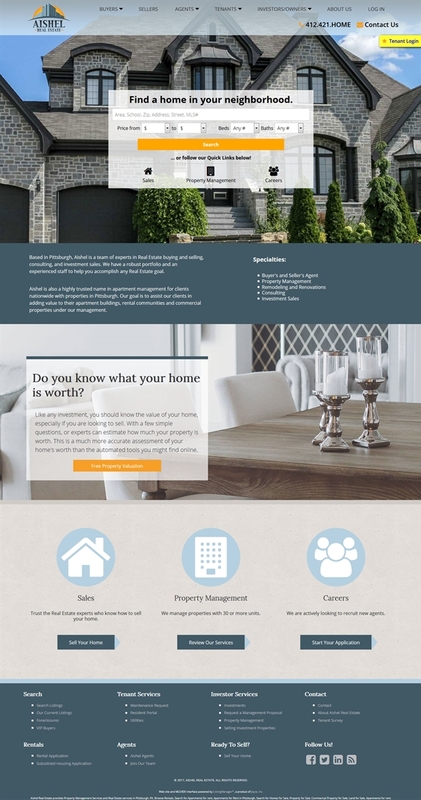 Aishel Real Estate's new homepage guides users toward the right section of the site with above-the-fold buttons for each of their business units. Although the home search for buyers is the most prominent piece of the homepage, there are quick buttons for sellers, property owners, and potential job applicants. The color scheme plays into the vibrant contrasting colors in the logo. The various shades of blue create a sense of reliability and sophistication, while the yellow accent colors are designed to draw the eye to action buttons. The site is rich with content and forms aimed at capturing leads quickly and easily. No matter what the user is looking for (buying a house, selling a house, renting a property, becoming an agent, or enlisting property management services) the new Aishel website helps create an exceptional first impression, provide helpful information, and convert users into clients. In addition to the broker's site, Aishel has invested in the design of agent websites. The agent sites will have full IDX capabilities, with all leads being routed to the agent. The templates will be used for recruiting and branding purposes. View the full site at www.aishel.com.